these are the characteristics that define our newest soft-performance dancewear Collection, Atelier. It's easy to see from browsing through the Collection that the Atelier garments were created to blend perfectly with each other, allowing for endless outfit options - but better yet, their refined, modern look allows the Atelier Collection to integrate effortlessly with your everyday wardrobe too. We headed to the street and the studio to show you how some of our own dancers and ambassadors pair their timeless Atelier pieces with wardrobe favourites. Who says embracing your sporty side has to involve spandex? Forget about lacklustre lycra and peeling skin-tight, damp clothes off after every workout. Instead enjoy an outfit that's inspired by mesh and loose-flowing lines with flattering fluidity and drape, making being active a literal breeze. A modern play on sporty-chic that lets you look as equally in your element at the park, on the tennis court or sipping strawberry milkshakes at the down-town diner. Channel Bianca's gorgeous Parisian vibes by styling the high-necked Nova Leotard in Cosmic with a loose cropped tank like this stylish Mesh Throw Over Top (or the Grey Marle Cotton Throw Over Top, below, for something a little more low-key), and our iconic Atelier Sadie Volume Shorts in Cosmic to match! Slip on your favourite white runners (in white for an extra dose of freshness) and voila! The perfect summer outfit for all-day versatile sportswear. Whilst 'minimal effort' is always a no-no in the studio, minimal effort style is a lifestyle choice we should all aspire to. Some people know how to throw together the most charming, chic outfits with only the bare basics and seeming carefree ease, and Alexandra McMaster is definitely one of those ladies! No doubt about it, when you're putting maximum effort into training and class time there's nothing better than having an artillery of carefully-crafted basics on hand to make spontaneous weekend outfits as attractive as they are hassle-free. Steal Alex's ultra-wearable retro, low-key ensemble by tucking your Grace Detailed Back Tee into some vintage, high-waisted denim jeans and rolling up the cuffs. The tapered white mesh panel on the back of the tee draws the eyeline down to accentuate the narrowed waist and adds some extra texture to the denim-on-cotton (...100% organic cotton we might add!) pairing, and invites finishing the look off with some trusty white converses or vans. Transitional style can be a hassle for dancers; warm-up gear and leotards that look great in dance class can leave you feeling a little less 'Odette' and a little more 'ugly duckling' once you step outside the studio. There's no reason you can't feel elegant and put together though without hauling a whole new street wardrobe around with you. Let your Atelier garments bridge the gap between dancewear and streetwear to make fashion-on-the-fly a piece of cake. 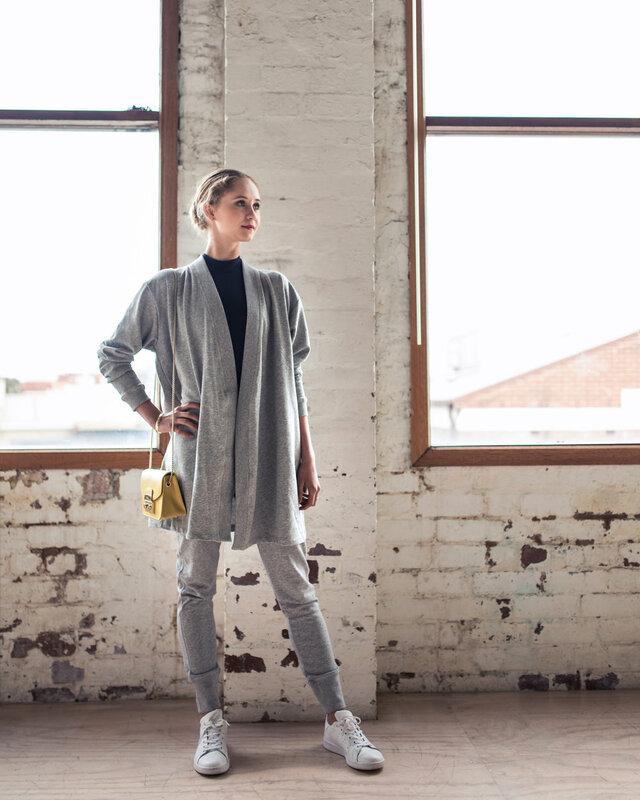 Try pairing the exquisite Kora Kimono in Grey Marle with a classic, high-necked leo (like the gorgeous Nova Leotard) in a darker hue for the ultimate blend of sophistication and comfort. Finish the look like Bianca does with the matching Avery Track Pants, with their loose fit and tailored cuffs making them the perfect compliment to the tapered sleeves of the Kimono, and elevating this look well beyond warm-up or workout (and right into your wardrobe favourites). When we're not busy on the stage or in the studio ourselves, us dancers like to get out and enjoy the night-life just as much as the next person, and whether that's attending a premiere, heading out for post-performance dinners with our friends or (surprise surprise) heading to the dancefloor for some off-duty freestylin', whatever the case, it's nice to know there's an outfit that's got you sorted round the clock. Head straight from performance to after-party with your Aubrey Knot Long Sleeve Tee; elegant and understated this t-shirt-come-dress can be styled up with your favourite pair of boots or heels, and the high neckline presents the perfect opportunity for a feature necklace to accessorise with and draw the eyeline down to the beautiful knot detailing that makes the Aubrey so unique. With it's lightweight modal fabric it's the perfect companion for summer nights, or steal Alex's gorgeous look and pair the Aubrey with a faux-fur cropped jacket and statement clutch to make the outfit trans-seasonal. Maqnifique! Just to prove you really can't have too much of a good thing, our favourite new look of the season is equal parts bold and subtle; equal parts black and white (but better than either on their own). Capture the carefree fashionista vibes of Lucy's outfit by selecting the perfect shade of grey; creamy, classic, graceful Grey Marle, and layering up with an eye for texture! Knotting our stunning Grace Detailed Back Tee at the hip creates a tailored waist offset by the loose volume of the Kora Kimono, and with both garments featuring striking mesh panels at the back, it's an outfit that's just as luscious from every angle. Perfect for dressed up brunches and trips to the city, complete the look with the tailored Avery Track Pants, statement heels or boots in the colour of your choosing and the perfect pair of shades. If comfort is your personal priority like it is ours, then get ready to be obsessed with the plushest, most wearbale fashion statement to date! The Dusty Rose & Cosmic combo is our favourite bright colour pairing this season, and apart from looking like everything you’d ever want to see in a delicious berry smoothie, it’s also the most playfully wearable way to add a little vibrance to your everyday wardrobe (not to mention boost your spirits at the same time!). If conquering the colour spectrum is all in a day’s work for you though, raise the stakes with some styling hacks to take the outfit’s prettiness factor up a notch; like Alex, take advantage of the loose fit of the Alyssa Overlay Singlet by fashioning a knotted bow at the back to cinch the waist and create your own customised cropped tee. The white mesh detailing in the lower back of the tee makes for an extra sweet two-tone detail on the bow, and when combined with the loose, tapered elegance of the Sadie Volume Shorts, the pair accentuate the flattering hourglass figure of the waist, complete with a sliver of skin peaking through at the back. Get ready to turn some heads! When it comes to fashion you can’t get more classic than black, and it’s easy to see why; the perfect compliment to any colour and every skin tone, naturally flattering and virtually impossible to make a faux pas with… opting for all black attire is the fashion equivalent of putting on an episode of Friends (name one person who doesn’t like Friends… And how could they? It’s a classic pick that never gets old, just like the little black dress). There’s no reason for repeats with black though, and going all-noir is the opposite of boring if you up your styling game; use a monochromatic outfit to accentuate texture and shape with this double-mesh combination. The striking full mesh sleeves of the Astrid Crop make the perfect duet when worn with the Atelier Zara Extended Mesh Legging with their sleek calf-high mesh panels and mesh stirrups. Plus pairing high-waisted leggings with a crop is the ultimate way to break up colour-blocking with a perfectly placed hint of flesh. The Zara’s high waist and full length mesh stirrups also makes the absolute most of streamlining, elongating the body and maximising on leg-length. Sign us up!